Home > Shop By Brand > McKee's 37 Waxes, Compounds, Coatings > McKee's 37 Leather Conditioner 128 oz. Anti-aging cream for your vehicle's leather, vinyl and plastic surfaces! 1. You purchased an expensive luxury car or SUV that came standard with leather seating surfaces. 2. Your vehicle offered leather upholstery as an upgrade from cloth, and you opted for it. 3. Your vehicle did not offer leather as an upgrade from the factory, so you had it installed from an aftermarket upholstery shop. The point is, regardless of how your vehicle ended up with leather upholstery, you paid for it! Clean and protect it using QUALITY products,or in this case, one product – McKee's 37 Leather Conditioner. Do you like the smell of new leather? We do! McKee's 37 Leather Conditioner will make your interior smell like that of a $250,000 British Luxury Sedan that has acres of leather inside. This is made possible by quality chemistry that forgoes inexpensive, high-octane solvents and greasy petroleum distillates. 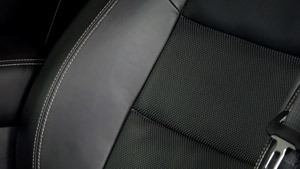 Apply McKee's 37 Leather Conditioner to any leather surface in your car using a microfiber applicator. As you work around the car and see dirt and grime accumulating on your applicator pad, switch to a clean applicator pad. McKee's 37 All-In-One Leather Lotion is not a magical cream that restores older, neglected leather to like new-condition – the truth is, such a product does not exist. What it is designed to do is PREVENT long-term leather deterioration from happening in the first place. We know your time is valuable, which is why we created a product that cleans, conditions, AND protects in one step. Here's the kicker: you actually have to use McKee's 37 Leather Conditioner in order to reap the benefits! Here's the good news: McKee's 37 Leather Conditioner only takes minutes to apply, and it's 100% safe for leather, vinyl, and plastic interior trim. As a matter of fact, the durable UV inhibitors found in this luxurious lotion are beneficial for plastic and vinyl surfaces. Synthetic lanolin oils penetrate deep into the pores of the leather, keeping it nourished so it remains soft and flexible. Regular application will also reduce the effects of dye-transfer on lighter colored leather.